How to choose a micro-CT scanning trajectory, and how various acquisition geometries affect image quality and reconstruction speed, as well as the differences between circular and helical scanning. Circular acquisition geometry: The simplest case, where the object and source-detector rotate during the scan. Non-circular acquisition geometries: Involving more complex, simultaneous or sequential rotation and translation. The quality of the micro-CT image reconstruction can be significantly improved by employing different geometries. For example, circular scanning can in some cases produce artefacts. It’s also important that the reconstruction algorithm matches the acquisition geometry. The Bruker SkyScan range includes systems with both circular and non-circular (helical) scanning trajectories. Long objects that do not fit in a single vertical camera field of view. Short distances between the source and the detector, with a large beam opening angle. Titanium implant with two 12mm washers scanned, showing the difference in reconstruction quality with a circular and helical trajectory. Filtered back-projection algorithms are most popular with cone-beam tomography systems. This type of algorithm was originally developed by Feldkamp, Davis and Kress. It was first published in 1984 and is also known as an FDK algorithm, with the first letters of the developers’ names. NRecon, one of Bruker’s micro-CT reconstruction software packages, uses the FDK algorithm. Reconstruction is performed using the CPU with multi-threading or acceleration with the GPU and graphical cards. Graphical cards usually outperform CPU, with faster image reconstruction speeds. One way of speeding up image reconstuction is to upgrade your hardware, with graphical cards or clusters. Another method is to use a more efficient algorithm. A good option is a hierarchical back-projection algorithm. This accelerates the process by dividing the volume into smaller sections, which require fewer projections for reconstruction. This is especially effective with larger datasets. The InstaRecon engine for NRecon uses this type of hierarchical reconstruction algorithm. It was developed by Bruker together with their partner InstaRecon Inc. Using patented algorithms, reconstruction can be performed many times faster using just one PC than a whole cluster. 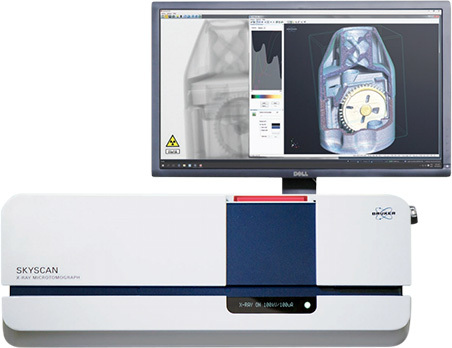 InstaRecon is compatible with all Bruker SkyScan micro-CT system, and can be used to upgrade existing installed instruments. Vertical slices through a 9 V battery, taken with the Bruker SkyScan 1275. Helical scanning eliminated the surface blurring that appears using the circular trajectory. The scan on the right uses an exact reconstruction algorithm. With a helical scanning trajectory, the object is rotated and translated simultaneously along the rotation axis during data acquisition. Using this trajectory, tomographical reconstruction is exact, rather than approximate. In many cases, reconstruction artefacts can be eliminated, especially in scanners with wide X-ray beam openings. For example, it reduces surface blurring at surfaces perpendicular to the rotation axis at high cone angles, as shown in the image of the battery below. Long objects can also be scanned without stitching multiple images together. Exact reconstruction is required to unlock the full potential of helical scanning (also known as spiral scanning). This functionality is available with Bruker’s NRecon software, in partnership with iTomography. Amy Crabtree has worked in scientific communications in the UK for ten years, with experience of a range of technologies including NMR, Mass Spectrometry, X-Ray Analysis and Infrared Spectroscopy.